Stephanie F. Lehman focuses her practice on matrimonial law and related tax matters, in both New York and New Jersey. For well over a decade, she has represented high-net worth individuals in contested and uncontested matrimonial actions, child-related matters including custody, parenting time, relocation and paternity, and domestic violence cases. 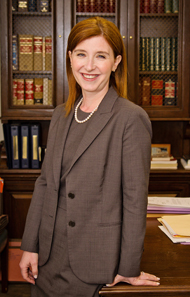 She has experience handling trial- and appellate-level proceedings, as well as mediation and collaborative processes. Stephanie negotiates prenuptial, postnuptial, settlement and separation agreements, and advises clients regarding pension and retirement plans, stock options and grants, trusts, limited partnerships, closely held corporations, and the valuation of businesses, professional licenses, enhanced earning capacity and celebrity status. Following her graduation from law school, Stephanie served as a law clerk for the Honorable Joseph C. Cassini, III, of the New Jersey Superior Court, Family Division. Prior to joining HDRB&B, Stephanie was a partner in the New York offices of WolfBlock LLP and then Cozen O'Connor, which are among the largest law firms in the country. She is a member of the Family Law Section of the New York State Bar Association and the New York City Bar Association, and was a member of the Matrimonial Law Committee for the term 2008-2010. Stephanie has published several articles for the Matrimonial Strategist , a legal publication, and the New York Law Journal . She has lectured for the New York State Bar Association and written materials for the Basic Matrimonial Law Series sponsored by the New York State Bar.